CASH FOR GOLD shops in Ireland should introduce new rules which mean sellers have to produce proof of their identity before the gold is accepted, a TD has said. Under the model used in Australia, which Labour TD Derek Nolan has proposed should be implemented in Ireland, all gold is photographed and sent to the police before being accepted by the shop, meaning that it cannot be sold on for thirty days. In Australia, Cash for Gold shops also have to be licensed, which costs the equivalent of around €10,000. The Galway West TD has asked Justice Minister Alan Shatter to introduce similar constraints for the trade in Ireland. “There appears to be specific rules and regulations for pawnbrokers, but the same does not seem to apply to the Cash for Gold industry,” said Nolan. 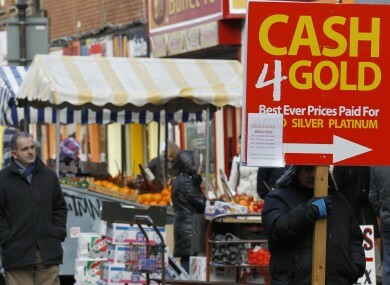 The Labour TD said that the increasing trade by Cash for Gold shops is causing concern in local communities right across the country. On Tuesday the Minister for Justice published a major report into Cash for Gold shops which examined whether any possible criminal activity is taking place. The price of gold has increased dramatically during the ongoing economic crises throughout parts of the world as investors have rushed to put their money in what is typically seen as a safe investment. Gardaí have visited every one of the 124 Cash for Gold shops in the country as part of a major crackdown to ensure that stolen gold is not exchanged for cash at the shops. Burglaries in Ireland increased by almost 8 per cent in 2011 compared to 2010, after dropping for several years in a row prior to that. Email “Cash for Gold shops should ask for proof of identity, says TD”. Feedback on “Cash for Gold shops should ask for proof of identity, says TD”.